Though the Trump administration rescinded Obama-era guidelines encouraging colleges to factor race into admissions, it doesn't force campuses to change their policies. The University of Texas at Austin did not back away from its affirmative action policy when opponents fought it all the way to the U.S. Supreme Court — and shows no signs of doing it now that the Trump administration has officially renounced the use of race in admissions. "The U.S. Supreme Court in 2016 affirmed the University of Texas’ efforts to enroll a diverse student body that provides educational benefits for all students," UT-Austin President Gregory L. Fenves said in a statement. "The University of Texas seeks to provide the highest quality education for our students, and diversity is essential to those efforts." On Tuesday, U.S. Attorney General Jeff Sessions rescinded several policy guidelines that shaped the Obama administration’s embrace of affirmative action in elementary, secondary and postsecondary schools and laid out a legal framework for universities to consider race in admissions in an effort to bolster campus diversity. The move — which is not binding and doesn't require schools to alter their existing admissions practices — appears to restore a Bush-era position that urged “race-neutral methods” in admissions. The federal government’s about-face is the latest front in the Trump administration’s battle against race-based affirmative action. The U.S. Justice Department is currently investigating Harvard University’s admissions practices, and it has filed a legal brief in a high-profile lawsuit challenging Harvard’s use of race in admissions. The affirmative action opponent who helped orchestrate that case, Ed Blum, was also instrumental in a lawsuit against the University of Texas’ admissions practices that came before the U.S. Supreme Court in 2016. The court ultimately ruled 4-3 in favor of the university in a decision that upheld the use of race in college admissions. 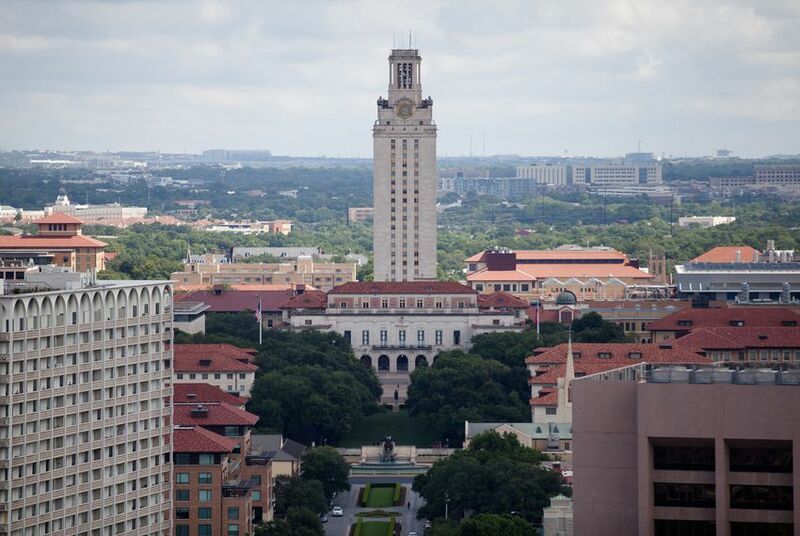 About 75 percent of UT-Austin students currently receive automatic admission to the school through the Top 10 Percent Rule, a state law that extends offers of admission to Texas students near the very top of their high school class. The university has factored race and ethnicity into its admissions decisions for the remaining applicants since 2003, when a different U.S. Supreme Court ruling declared race-based affirmative action constitutional. Other public universities in Texas, including those in the Texas A&M University System, already leave race out of admissions. A&M administrators have defended that approach, arguing that the Top 10 Percent Rule and targeted recruiting efforts are enough to increase student diversity. The proportion of black and Hispanic students at the system's College Station campus more than doubled from 2003 to 2015 — though, at 23.1 percent, it remained below UT-Austin’s black and Hispanic enrollment. A 2017 Texas Tribune review found that the Top 10 Percent Rule similarly promoted diversity among UT-Austin students; the proportion of Hispanic students in the automatic-admit cohort was higher than the proportion in the pool admitted through the admissions process that considers race. UT-Austin has argued that its affirmative action policy is a necessary proactive measure to compensate for a past colored by racism. In a brief filed in Fisher v. University of Texas, UT-Austin officials made the case for classroom diversity. “The educational benefits of diversity include, but are not limited to, bringing unique and direct perspectives to the issues and topics discussed and debated in classrooms, promoting cross-racial understanding, breaking down racial and ethnic stereotypes and creating an environment in which students do not feel like spokespersons for their race,” the brief stated. After Sessions withdrew the Obama-era guidelines — which the U.S. Department of Justice and the U.S. Department of Education had issued jointly — U.S. Secretary of Education Betsy DeVos encouraged schools to take their cues from the courts. "The Supreme Court has determined what affirmative action policies are Constitutional, and the Court’s written decisions are the best guide for navigating this complex issue. Schools should continue to offer equal opportunities for all students while abiding by the law," she wrote in a statement Tuesday afternoon. The Harvard case could be the next affirmative action case to land at the U.S. Supreme Court, and if it does, the outcome might be different. U.S. Supreme Court Justice Anthony Kennedy, who announced his retirement last week, cast the swing vote in the Fisher v. University of Texas case. “Considerable deference is owed to a university in defining those intangible characteristics, like student body diversity, that are central to its identity and educational mission,” Kennedy wrote in the majority opinion. Trump said he will unveil his choice for Kennedy’s replacement on July 9. He has vowed to pick a conservative, and his nominee could tip the balance against affirmative action. Disclosure: The University of Texas at Austin and Texas A&M have been financial supporters of The Texas Tribune, a nonprofit, nonpartisan news organization that is funded in part by donations from members, foundations and corporate sponsors. Financial supporters play no role in the Tribune's journalism. Find a complete list of them here.